Located in Sydlangeland, this family-friendly vacation home is 0.6 mi (1 km) from Ristinge Beach, and within 9 mi (15 km) of Danmarks Naturfond, Skovsgaard and Skovsgaard Gods. Langelands Museum and Langelandsfort are also within 12 mi (20 km). 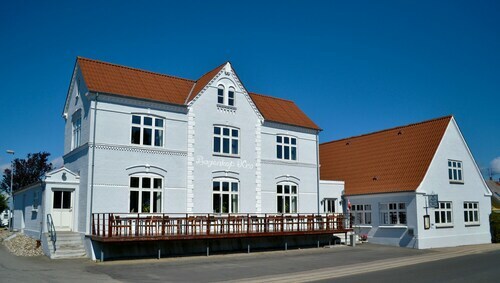 Situated by the sea, this hotel is 2.1 mi (3.4 km) from Langelandsfort and within 12 mi (20 km) of Ristinge Beach and Danmarks Naturfond, Skovsgaard. Skovsgaard Gods is 10.5 mi (16.8 km) away. Situated in Sydlangeland, this vacation home is 1.7 mi (2.7 km) from Ristinge Beach and within 9 mi (15 km) of Danmarks Naturfond, Skovsgaard and Skovsgaard Gods. Langelandsfort and Langelands Museum are also within 12 mi (20 km). Situated in Sydlangeland, this vacation home is within 6 mi (10 km) of Langelandsfort, Ristinge Beach, and Danmarks Naturfond, Skovsgaard. Skovsgaard Gods and Langelands Museum are also within 12 mi (20 km). How Much is a Hotel Room in Sydlangeland? Hotels in Sydlangeland start at $96 per night. Prices and availability subject to change. Additional terms may apply. You may have noticed that there are no Travelocity-featured lodging options within Sydlangeland itself. Rest easy, because about 12 hotels are ready to be discovered within a reasonable drive from Sydlangeland. The closest Travelocity accommodation is the Best Western Hotel Svendborg, Denmark, which is situated 18 miles (30 kilometers) from the business district of Sydlangeland. A secondary handy Travelocity-listed option is the Hotel Troense, which is located in Denmark, 16 miles (26 kilometers) from the central area of Sydlangeland. The Hotel Ærø - Svendborg is positioned 18 miles (29 kilometers) from the central part of Sydlangeland. Alternatively, the Hotel Garni Svendborg is 18 miles (30 kilometers) away. The Femmasteren Hotel & Vandrerhjem and the Holmegaarden are two alternative places to book accommodation around Sydlangeland. Looking for more activities? Spend a few hours discovering Hans Christian Andersen Museum and Odense Zoo, in Odense, 45 miles (68 kilometers) north of Sydlangeland. The Best Western Hotel Knudsens Gaard and Hotel Plaza are a handful of the Travelocity-recommended lodging options in Odense. 35 miles (59 kilometers) north of Sydlangeland, is Nyborg, which boasts the Hotel Hesselet and Hotel Villa Gulle. If you stay in Nyborg, a couple of sights worth adding to your itinerary are the Vor Frue Kirke and Torvet. Before you and your family leave Fyn, you should make sure you get down to watch a fast-paced match. Get to Fionia Park, to the north of Sydlangeland. For visitors who enjoy the ease of booking accommodation close to the action, book in the Scandic Odense or Radisson Blu H.C. Andersen Hotel, Odense. Sonderborg Airport is 40 miles (61 kilometers) from the city center of Sydlangeland. Wise travelers who need to find accommodation nearby can reserve a night at the Scandic Sønderborg or the Rønhave.